Introducing the new Ball® FreshTECH Automatic Jam & Jelly Maker. 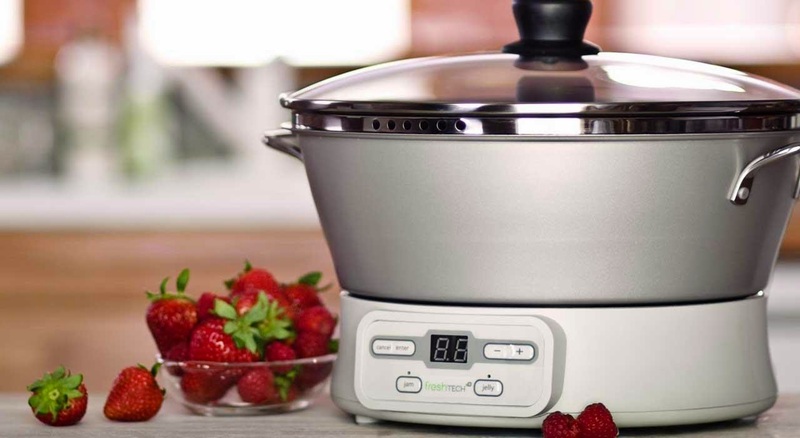 It uses SmartStir™ Technology to automatically stir your jam or jelly while it cooks so you don’t have to do the guesswork – you just set it and go! Once your jams and jellies are made you can enjoy them right away, freeze them for up to a year or use a simple waterbath canning process to fresh preserve them. I have become really excited about making my own jam and jelly. I love that I can buy my own organic fruits and make it at home for about a quarter of the cost of buying in the store. Plus, I can get creative with my ingredients! The Ball Automatic Jam and Jelly Maker is SO simple to use. Just 3 steps to ready to eat! …serve and enjoy your delicious homemade jam! Here is my favorite recipe for Strawberry Jam to get you started! You can purchase the Ball Automatic Jam and Jelly Maker here for about $99.99 or 3 easy payments of $33.33!